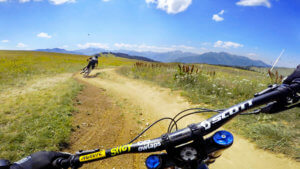 The biggest line at Les Saisies bike park: steep shoots, off-cambers and a big table jump! Les Saisies bike park is located in the French Alps, in the Beaufortain massif, Savoie. The biggest cities around are Albertville, Annecy, and Chambery. Beginners and families would appreciate the high number of beginner and improver trails there.